Nearly all fighters of WWII had same basic puller-propeller monoplane design that first appeared in mid-1930s, first of which was Me-109. Mustang's design was refined rather than radical, but it had important innovations from which it excelled. Its higher speed and range resulted from its laminar-flow wings, its radiator inlet/outlet provided net thrust, and its streamlined airframe had extremely low drag. Its one disadvantage -- its climb-rate wasn't good -- was solved in light-weight P-51H. There's no doubt Germans were the most advanced in aeronautical design. 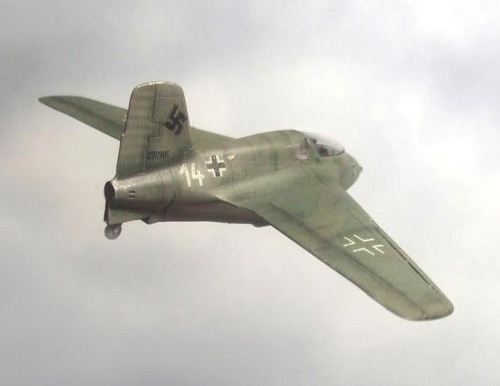 Horten Ho-229 already have features of US stealth drones (flying wing, anti-radar material, shrouded exhausts). Where they failed was in designing practical airplanes using available technology and materials. 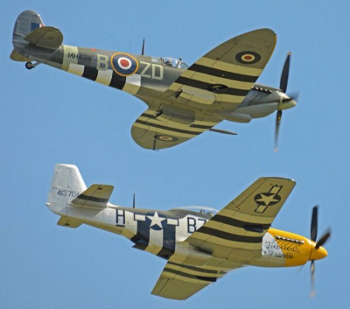 Main difference was size: Spitfire small, Mustang large. Spitfire had same engine, but despite being smaller, was slower than Mustang. Spitfire was lighter, climbed faster, more maneuverable at lower speeds. Its elliptical wings made Spitfire beautiful and turn more tightly. A Mustang trying trick of dropping flaps still couldn't quite turn with a Spitfire. Early Spitfire had superb maneuverability and graceful handling. But at 400+MPH, a Spitfire's controls stiffened and its maneuverability decreased substantially, while laminar-winged Mustang was designed to fly optimally at 400+MPH. Spitfire developed into a different airplane (Spiteful), as later marks became much faster but handling worsened. P-47 Thunderbolt was gigantic. Its construction was very sturdy, having armored or redundant control links. Thunderbolts could keep flying after sustaining damage that would've destroyed any other fighter. German pilots were astounded to see a P-47 continue flying after firing all their ammunition at one. Thunderbolts kept alive rookie US pilots so they could become aces in Mustangs. P-47 didn't have a propeller cone like FW-190 or Sea Fury had to reduce drag. 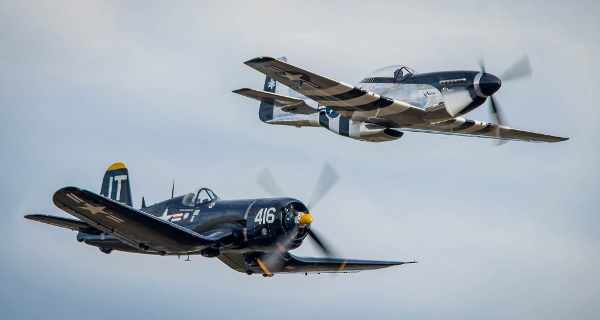 Not an academic comparison -- a Mustang and Corsair really were in a dog-fight. 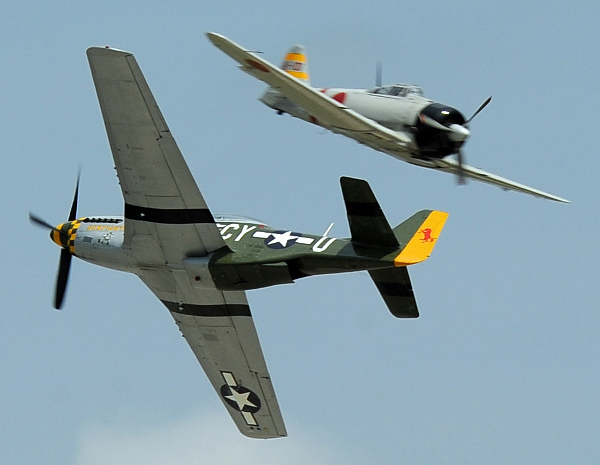 In 1969, Honduras and El Salvador had a brief air-war fought between Mustangs and Corsairs. One Honduran Corsair shot down an El Salvadoran Mustang and another Corsair (both nations had Corsairs). Lockheed's Kelly Johnson was a genius, but North American Aviation's Edgar Schmued designed a superior twin-engine fighter. 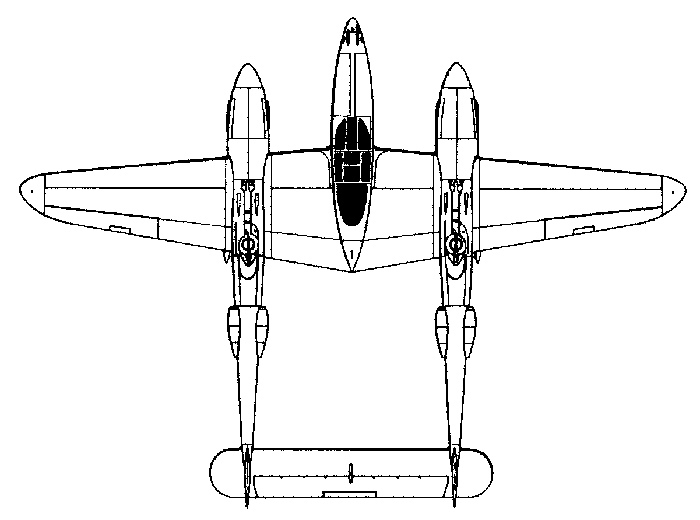 P-38 Lightning had far greater drag with a stub fuselage for cockpit. F-82 Twin Mustang was ~80MPH faster, almost as maneuverable as P-51, with a range equal to a B-29 Superfortress. A design is a team effort. But in this case, Schmued deserves much credit. Schmued drew original blueprint and was awarded a US patent (#D144,938 in June 4, 1946) for F-82's twin-fuselage design. P-38 had two engines, suited to flying over Pacific, and its turbo-superchargers muffled engine, making it a quiet comfortable plane. F-82 Twin Mustang had advantages in range, speed, maneuverability. 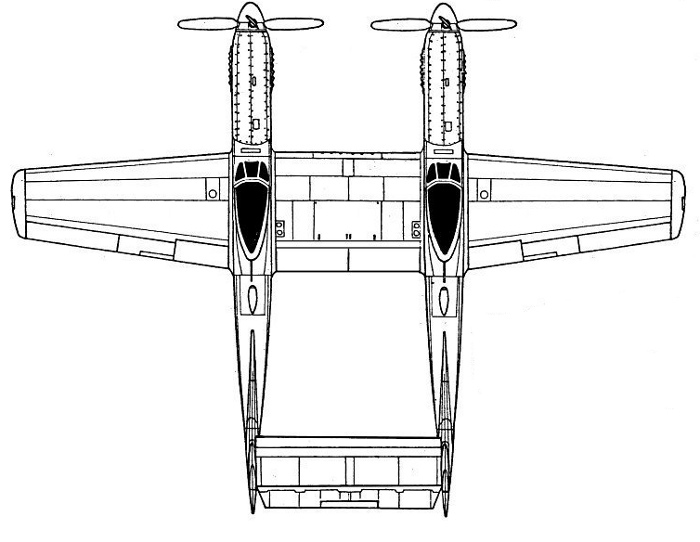 A false rumor persists that Twin Mustang was based on Me-609, a Me-109 with two fuselages, but they were independent designs. Schmued had idea in 1940 before Me-609 prototype was built in 1941. Zero could out-turn P-51 (and everything else). But it was very slow and fragile. 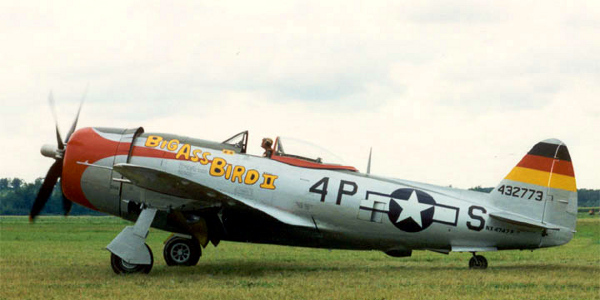 P-51 pilots were advised to attack it at high speeds and then zoom-climb away. Although innovative in 1935, by 1943, Me-109 was out-classed. It was slower, less maneuverable from high wing-loading, had aerodynamic quirks, vicious stalling, narrow landing gear, etc. Only veteran or lucky German pilots could survive in a Me-109. 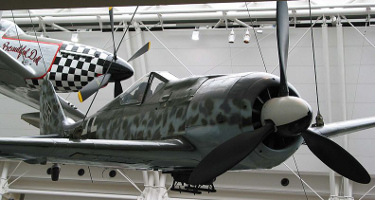 The nemesis of P-51 wasn't the jet Me-262 -- it was the radial-engine FW-190. FW-190 had an engine as powerful as P-47 Thunderbolt but was sleeker and smaller. An innovation it had was electrically-operated control surfaces. At low-altitude, FW-190 nearly matched P-51. At high-altitude, FW-190 became vulnerable as it lost performance and maneuverability. 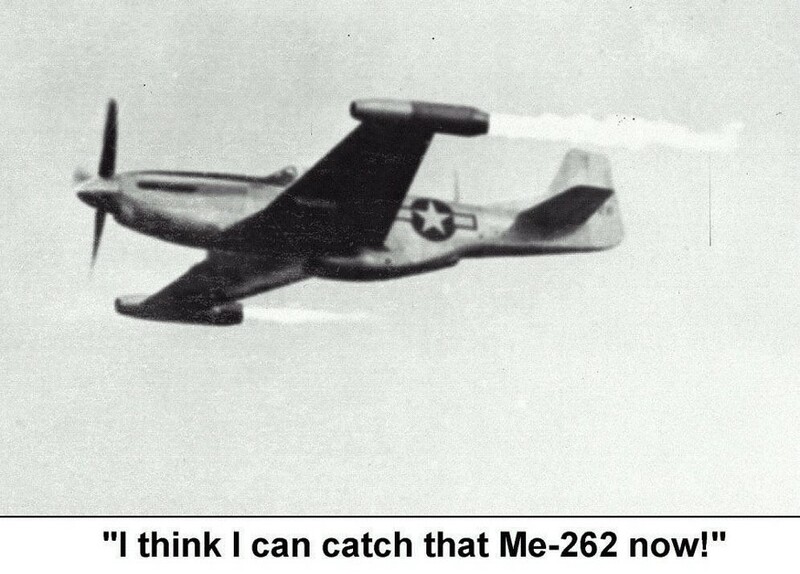 Many incorrectly believe propeller P-51s were totally outclassed, and much slower, than Me-262 jets. Me-262's top speed was reported as 515MPH or 540MPH [ref: Ziegler for 515MPH]. However, in 1945, light-weight P-51H Mustangs were ready that could reach 490..500MPH. [ref: Wagner, McLaren]. Both Me-262 and P-51H could only sustain their top speed for no more than 10 minutes without damaging their engines [ref: Ziegler, McLaren]. Prior to engagement, Me-262s were flying ~350MPH while climbing up to US bombers's altitude, while escorting P-51D Mustangs were poised to convert altitude to diving speed. Many escorting P-51 pilots shot down Me-262s by simply doing a Split-S maneuver [ref: Roscoe Brown, Candelaria], as within seconds, a P-51 would reach 500+MPH [ref: P-51 flight manual]. Trials of P-51 proved it kept its speed during a dive because of its low drag [ref: Caygill]. German Me-262 pilots reported they could not outrun a P-51 in a dive (Nowotny apparently was shot down after failing to outdive Mustangs) [ref: Ziegler]. P-51s and other prop fighters could easily outmaneuver Me-262s. If a Me-262 ever slowed down, it became vulnerable, because its jet engines provided far less acceleration than a propeller (pushing throttle on a Merlin V-12 engine shoved pilots back into their seats). Me-262 pilots were supposed to limit themselves to hit-and-run tactics on American bombers, never circling back if they missed, maintaining their speed to stay away from diving Mustangs. 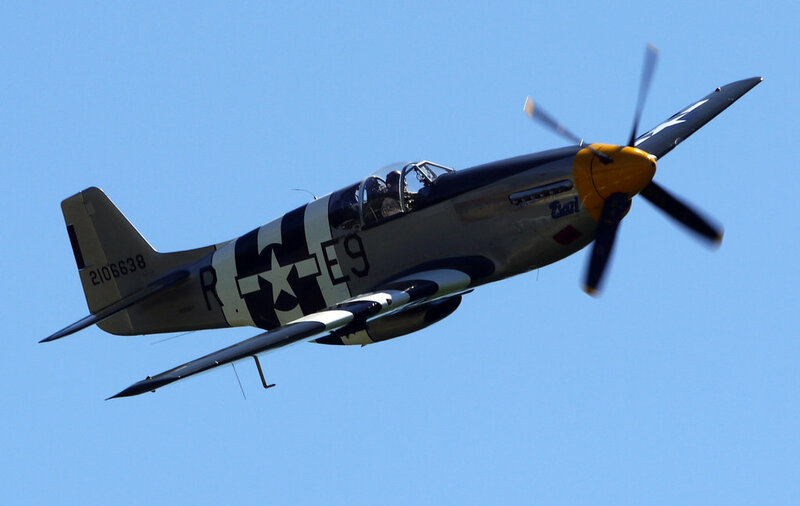 Enemy jets forced to stay away, ironically, was goal of escorting Mustangs. Faster light-weight P-51H might have been equal of Me-262 in a straight-line race, but before being deployed in Europe, slower P-51D Mustangs had succeeded in vanquishing Me-262s. Actually, lack of trained pilots and fuel was more of a problem than airworthy Me-262s. Ziegler's book describes how in 1945 surviving German pilots continued to fight even though they knew they would be completely outnumbered and ultimately overwhelmed by multitudes of pouncing Mustangs. In movie Red Tails, a P-51 firing head-on against a Me-262 was contrived by Lucas for drama, but in reality, would've been stupid. Me-262's nose was packed with large cannons and machine guns for destroying bombers, so Mustang would've been blown to bits! Somersault-while-firing trick was actually done by Richard Candelaria of another USAAF squadron [ref: History Channel's "Dogfights"]. Actual top speed depends on altitude and other factors. Top speed of Me-163 was 600MPH. Its climb-rate was phenomenal, twice as much as a P-51H or F-82, wasn't surpassed until advent of jet fighters like F-86 and MiG-15. Unlike wing-heavy Me-262, Me-163 was very agile. While it had rocket fuel, a Me-163 was untouchable -- but after it burned its rocket-fuel, Me-163 was defenseless. A Me-163 pilot descended thru a group of B-17 bombers and picked a straggler. A P-51 of 359th FG (Lt. Col. Murphy) was barely able to pursue it and hit it from 1,000 yards. Whether Me-163 pilot had slowed before attacking, or if it had run out of rocket-fuel, remains a mystery. P-51 and F-80 jet were definitely outclassed by near-supersonic MiG-15. 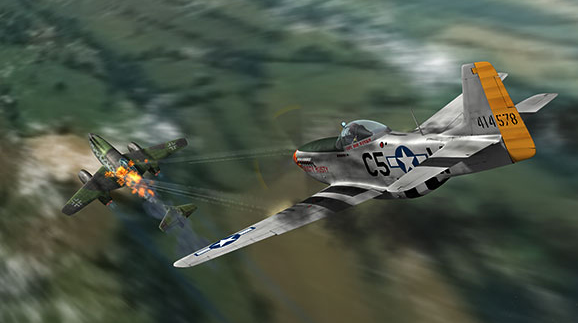 Many P-51s evaded attacking MiG-15s by turning hard, but about twenty P-51s were shot down. Did a P-51 ever shoot down a MiG-15? ...Mustang pilots Maj. John Yingling and Col. Joseph Rogers claim they shot down MiG-15s. In Air Force's Airman publication, Yingling claims his MiG-15 kill was confirmed, he was awarded a medal, but fact was kept off official records since MiG-15 pilot seemed to be Russian. US Air Force (af.mil): "Mr. Yingling is a World War II veteran of the Navy and began his Air Force Service in 1950 at the onset of the Korean Conflict. He is the only P-51 Mustang fighter pilot to shoot down a MiG 15." LA Times: "He [Col. Joseph Rogers] more than made up for his lack of combat in the Korean War -- flying 170 missions in a P-51 Mustang, a piston-engine plane in which he shot down a Soviet MIG jet." f-106deltadart.com: "On November 8, 1950, the then Capt. Rogers achieved a rare MiG-15 jet kill while flying in his piston-engine F-51D Mustang named Buckeye Blitz VI. 'This was unusual because of the speed differences between the two planes,' said Jim Cook, master crew chief at the Pacific Coast Air Museum in Santa Rosa and an old friend of Col. Rogers. 'He was doing around 350 mph, and the jet was doing 450. There were four MiGs, and they were so much faster. They came over the top of Joe, and he took a lucky shot at them.'" On Internet, a reference to book "P-51 Mustang: From 1940 to 1980" claims P-51s shot down MiG-15s in South Korea, but reverse seems more likely, or Mustangs shot down early MiG-3 propeller fighters (??). koreanwar.org: "Although our propeller-driven F-51 Mustangs were no match for the fast jets in air-to-air battles, we knew from our simulated 'dog-fights' between our F-80 jets and the Mustangs, that the '51 could survive a jet confrontation ...but only if strict, disciplined defensive tactics were applied, with very precise timing of each defensive maneuver. For example: the great speed advantage of the jets could be somewhat offset by the much tighter turning radius of the Mustang. So, when attacked by jets, the '51 pilot would have to keep a close eye on the attacking enemy fighter and make an abrupt, tight turn into the attacker at just the precise moment before the jet came into firing range. In that way the Mustang would have equal opportunity to fire at the jet in a head-on pass... trading gun for gun and for the moment, eliminating the enemy's advantage of speed."